When you are working on a database with a large number of objects sometimes it becomes a challenge to locate objects. Object Explorer in SQL Server Management Studio lists all objects according to category and it may be hard to locate specific object. 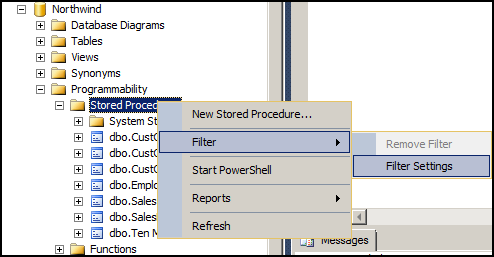 To resolve this you can Object Explorer provides filtering for objects. 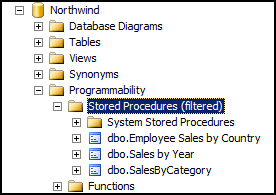 You can apply a filter in Object Explorer for common object categories. i.e. Table, Views, Stored Procedures etc. Step 3: To clear the filter and list all objects again, right click on filtered category and select Filter > Remove Filter. This will clear the filter applied. In earlier version of SQL Server Management Studio (2005, 2008 and 2008 R2) you can show/hide results pane using keyboard shortcut Ctrl+R. This shortcut was also present in Query Analyzer (SQL Server 2000). 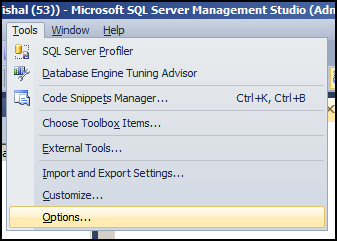 This shortcut is no longer available in SQL Server Management Studio 2012. In this version you need to use Ctrl+Shift+Alt+R to show/hide query results pane. Another alternative shortcuts you can use to show or hide results pane is Alt+WS and Alt+WI respectively. I find the later to be more easy to use. 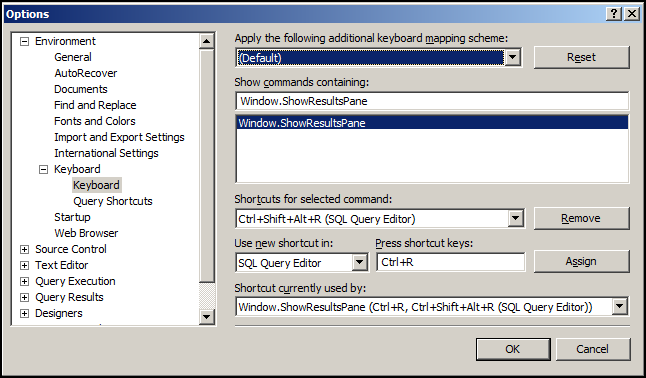 If you have gotten used to using old shortcut Ctrl+R you can customize shortcuts in SQL Server Management Studio. 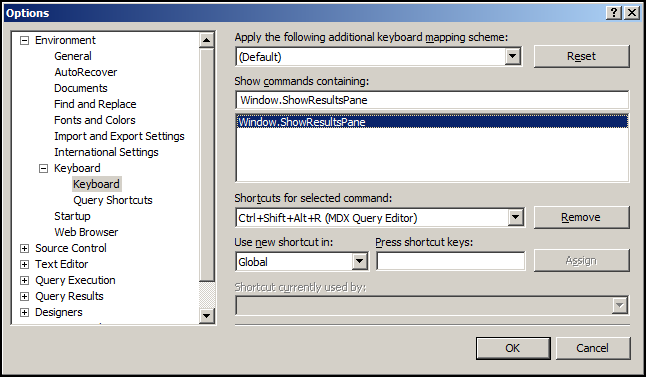 Step 3: Search for Window.ShowResultsPane using Show commands containing: textbox. (1) Select Ctrl+Shift+Alt+R (SQL Query Editor) in Shortcuts for selected command: list. 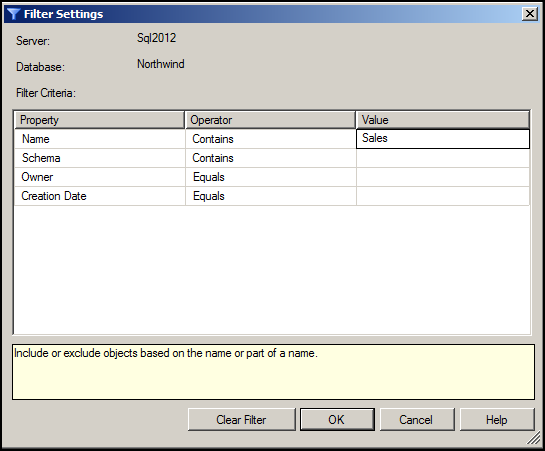 (2) Select SQL Query Editor in Use new shortcut in: list. 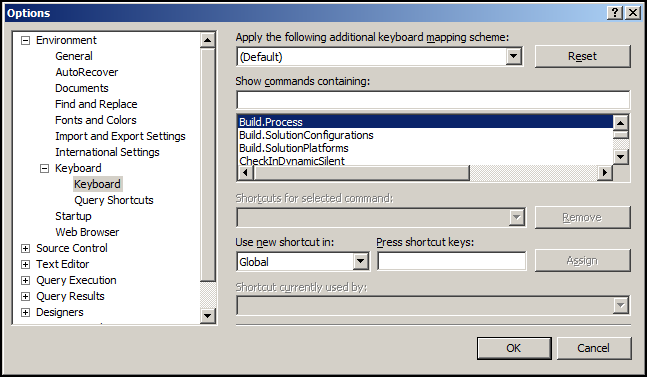 (3) Go to Press shortcut keys: textbox and press Ctrl+R or any other shortcut you need. (5) Click on OK to apply changes. Step 5: You need to restart SQL Server Management Studio to apply these changes. Note: The Window menu will still show Ctrl+Shift+Alt+R as shortcut we have only added an additional shortcut, we have not removed existing shortcut. Last time I posted about How you can add date/time to output file name, in which I used xp_cmdshell to execute the BCP/SQLCMD command using TSQL, which means we need to have xp_cmdshell server feature enabled for that solution work. There is a workaround available to that solution when xp_cmdshell is not enabled. On command prompt %date% return current date in short format. The ":~6,4" part is like a SUBSTRING function which returns 4 characters starting from position 6, which returns year. Similarly, we are retrieving month, day, hour, minutes using same function and appending all of this together to generate the file name in format "MyFile_YYYYMMDD_HHMM.txt"
You can export data from SQL Server using BCP command for SQLCMD utility. However, these utilities does not support dynamic file names when exporting data. For generating dynamic file names you can use solution provided below. In the examples below I have appended date/time to exported files. You can modify the logic to suit your requirement. I have selected string here to keep things simple. You can specify any query in stored procedure which produces required data. Step 2: Now, we will write the T-SQL code to export data returned from this stored procedure. Here we will use SQLCMD (you can also use BCP) to export data. We will execute SQLCMD using xp_cmdshell extended stored procedure. The above code will create the required file as "MyFile_YYYYMMDD_HH_MM.txt". You can verify the command generated by uncommenting the PRINT statement in the code above. Also, you can uncomment the fourth SET statement in case you want to use BCP command to export the data. Here, I have tried changing data type for 'Name' column from NVARCHAR(50) to CHAR(50). Since this requires table re-creation Management Studio does not allow this operation to be completed, and it is doing so for your own good! 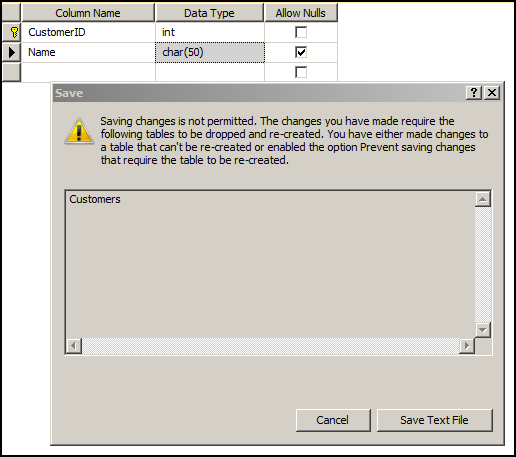 The above statement will change the data type of the 'Name' column to CHAR(50) without having to re-create table. We are better off with this option enabled. Although, if you are a GUI fan you can disable this safety net. 3. 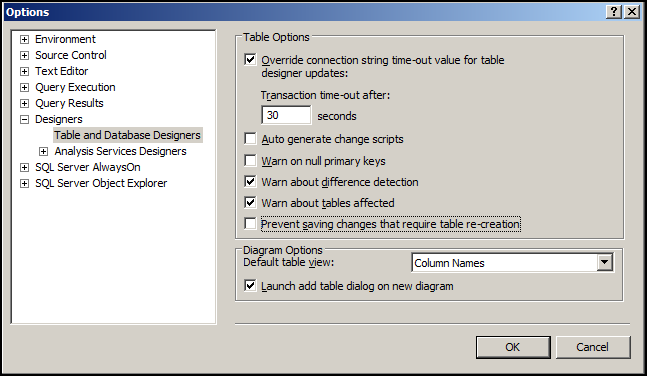 Uncheck Prevent saving changes that require table re-creation.